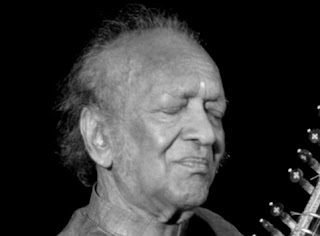 I can't claim to know much about Pandit Ravi Shankar's music, nor much about music for that matter; but it is safe to say that with his demise, the world of music has suffered another massive blow, and not just in the Indian scene but on a whole global front. In the 1960's when India was still struggling to segregate and discover it's own identity from that of the leftover influence of Brits, a musician from orthodox classical music background emerged as a music icon of the western hippie culture. Was it dumb luck that shot him to fame? Not Likely. Dumb luck is for Gangam Style, not the likes of people who understood and fused genres with polar differences and created a blend that could be grasped and loved by many. The multi talented Maestro wrote the Oscar-nominated score for 1982 film "Gandhi," several books, and mounted theatrical productions. His popularity exploded in the west for his multiple collaborations with western musicians, George Harrison being the most enduring one. Amongst his numerous performances in the west the most notable ones include the Woodstock Music Festival, Monterey Pop Festival and one at the Concert for Bangladesh at Madison Square Gardens in New York City (of which he was a co-organiser along with Harrison). Pandit Ravi Shankar’s influence in classical music, including on composer Philip Glass, is equally noteworthy. His work with Menuhin on their "West Meets East" albums in the 1960s and 1970s earned them a Grammy, and he wrote concertos for sitar and orchestra for both the London Symphony Orchestra and the New York Philharmonic. Pandit Ravi Shankar has been the recipient of many prestigious awards and recognition. Silver Bear Extraordinary Prize of the Jury at the 1957 Berlin International Film Festival, Sangeet Natak Akademi Award; the three highest national civil honours of India: Padma Bhushan, in 1967, Padma Vibhushan, in 1981, and Bharat Ratna, in 1999, just to name a few. He was made an honorary Knight Commander of the Order of the British Empire by Elizabeth II for his "services to music". He will also receive lifetime achievement Grammy award posthumously, making him the first Indian recipient of the award. The 55th annual Grammy Awards show will be held in Los Angeles on February 10, 2013. Pt. Shankar’s contribution to Indian music is equally substantial – from composing music for Apu Triology to working as the music director of All India Radio, New Delhi, from 1949 to 1956. His legacy however, is not limited to being a brilliant sitar virtuoso; rather, the fact that he helped assimilate traditional Indian Raagas into the ever progressing world of rock and roll, thus opening the flood gates of fusion. He helped to craft and develop a genre of music that the whole world could understand, relate to and enjoy. While fusion experiments may not always be successful, but with the sitar going global and forming a core part of rock ballads, jazz and world music, Shankar threw light on centuries-old traditions of Indian music which would have otherwise remained unknown. Niklas Stålvind, lead guitarist of the Swedish heavy metal band ‘Wolf’ himself played the sitar on the track “Electric Raga. A synergy like that is feasible today, thanks to the vision that Pandit Ravi Shankar had many decades back. There’s little wonder why George Harrison of Beatles labelled him as the ‘godfather of world music’.